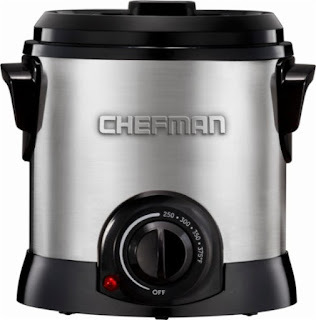 Today ONLY - Chefman - 1.1 Quart Deep Fryer ONLY $19.99 (Retail $39.99). Prepare your favorite fried foods with this Chefman deep fryer. Its 4.2-cup capacity lets you fry several servings at a time, and the stainless steel cool-touch exterior keeps this fryer's outside surface from getting too hot. This Chefman deep fryer has a rotary dial that lets you adjust the frying temperature.